Our guidance and advice to help manage common infections and tackle antimicrobial resistance. We've been asked by the Department of Health and Social Care to develop evidence-based, clinical syndrome specific guidance and advice to help slow the development of antimicrobial resistances. 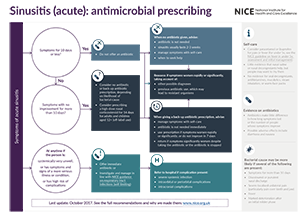 Existing Public Health England guidance on management and treatment of common infections - antibiotic guidance for primary care will be replaced over the next few years by new NICE/PHE antimicrobial prescribing guidelines. Our guidelines offer evidence-based antimicrobial prescribing information for all care settings. They focus on bacterial infections and appropriate antibiotic use. Each guideline topic features a visual summary of the recommendations, a guideline and an evidence review. The visual summary is an overview of the guideline recommendations. 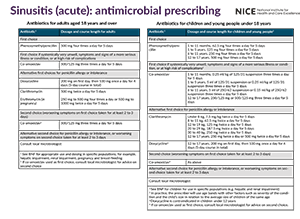 It includes a prescribing table to support shared antimicrobial prescribing decisions in line with a health professional’s own clinical judgement. 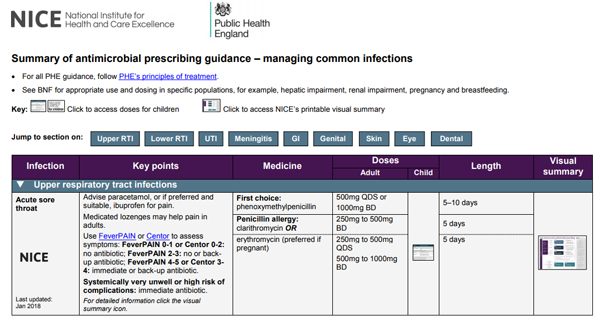 NICE and Public Health England (PHE) have brought together our information on managing common infections into a summary table. We will add a summary of new NICE guidance as it's published. We also indicate where new guidance is in development. The evidence and rationales underpinning the information in the table can be accessed by clicking on the hyperlinks or the visual summary icons. The processes used by each organisation to develop their guidance differ. The process for developing the NICE guidelines can be found in the interim process guide. The process for developing the PHE guidance is briefly outlined on the PHE website in the PHE context, references and rationales document with further information available upon request. This is the first time both sets of national guidance have been brought together and we would welcome your feedback. Please email infections@nice.org.uk if you have any feedback to help improve future versions. Our antimicrobial evidence summaries provide commissioners, providers and health professionals with a summary of the best available evidence for antimicrobials. Why is our guidance and advice needed? 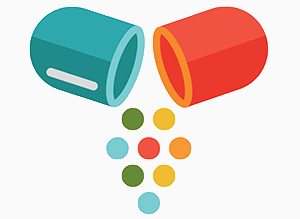 The World Health Organization states that 'antimicrobial resistance occurs when microorganisms such as bacteria, viruses, fungi and parasites change in ways that render the medications used to cure the infections they cause ineffective'. 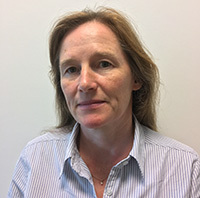 Resistance to antimicrobials is complex and increasing. Combined with a lack of new antimicrobial medicines, there is a growing risk that infections may not be treatable in the future. The Department of Health and Social Care asked us to develop guidelines to help slow antimicrobial resistance. These guidelines are evidence-based and clinical syndrome specific. Read more about the importance of antimicrobial resistance at Health matters: antimicrobial resistance. People should take honey or cough medicines instead but speak to their GP if it persists for longer than three weeks.